We are looking for secondary school girls who have gone above and beyond the compulsory volunteer hours. Are you that girl? Tell us about your volunteerism. We are offering 2 awards of $250 each. One to a girl in the Grand Erie District School Board and one to a girl in the Brant Haldimand Norfolk Catholic District School Board. 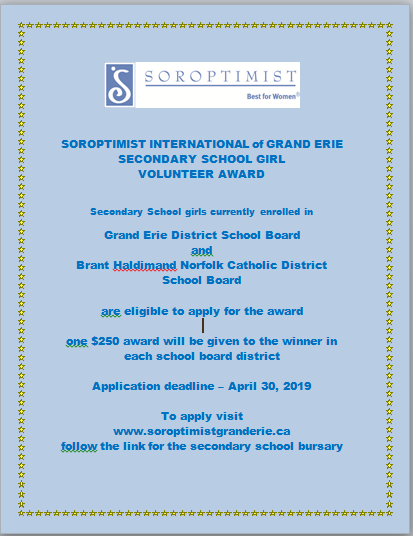 Soroptimist International of Grand Erie, chartered in 2014, serves the communities of Brant County, City of Brantford, Norfolk County and Six Nations of the Grand River. The name ‘Soroptimist’ means “best for women”. Soroptimist are women at their best, working to help other women to be their best. Soroptimist is an international organization for women who volunteer to improve the lives of women and girls. There are almost 80,000 Soroptimist in 120 countries and territories who contribute time and financial support to community based and international projects that benefit women and girls. Soroptimist believes the most effective way to empower women and girls is by providing them with access to education. Educated women and girls are far more likely to realize their potential. Soroptimist’s Live Your Dream: Education and Training Awards forWomen annuallydisburses nearly $1.9 million in education grants to more than 1,300 women who have overcome enormous personal obstacles.